We were all over Washington in 2014, with forays into Oregon and Idaho, with the bulk of our days spent on the trail - organizing trail races, gathering intel for future trail endeavors, doing trail work in and out of race-weekends, or simply learning what opportunities exist for sustainable trail education across the Northwest. 2015 was more of the same - plus some bigger, better organized trail work parties - and 2016 was a year of increased growth! We can tell you we have lists upon lists of trails we want to see, trails we want to explore, and trails we want to help improve. We can also tell you that we know we're not the only ones who love trails. If you have a favorite trail you love, we'd love to hear about it. If you have a trail you'd love to help us advocate for, or work on, we'd love to hear that, too. We've plenty of dates and locations below where we're going and went in 2016, plus everywhere we went in 2014, and everywhere we went in 2015, and you can expect more details about upcoming 2016 and 2017 trail work and other adventures as we have them! We're still finalizing our 2017 itinerary, but as it comes together, you can expect it here. 2014 was the year of doing trail work as we found opportunity and as we saw the need, often as we were on the trail ourselves and/or while we were directing trail races for Rainshadow Running and Endless Trails, in cooperation with local and regional land-managers. In 2015 we were better prepared, with more opportunities for you to join us. 2016 was epic, indeed. If you want to know about more upcoming trail work opportunities, go here, or email us! Intermittent trail work in central Idaho as the snow melted and the trails opened up. Fall and annual prep. Trail work in central Idaho as we found opportunities and the snow continued to melt. Northwest traveling, trail working, truck-camping. More trail work in central Idaho as opportunities presented themselves. Prepping for 2017, and more trail work weekends as opportunities presented themselves. Prepping for a bigger and badder 2017! 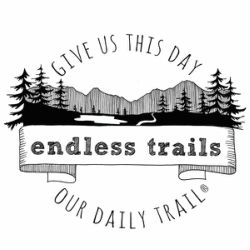 IF YOU'D LIKE TO MEET UP WITH US, SPONSOR ANY ENDLESS TRAILS ENDEAVORS/TRAIL WORK DATES, OR HAVE ANY QUESTIONS OR COMMENTS, LET US KNOW! WE'D LOVE YOUR INPUT, AND APPRECIATE YOUR SUPPORT.